Rachel Maddow made the point on MSNBC that contrary to what Romney had said, Syria is not Iran’s "route to the sea." Her comment was followed by graphic illustrations which showed that both Iran and Syria had coasts. Al Sharpton, on the same MSNBC show, offered the fight metaphor in his scoring of the debate, saying that at every moment Obama was about to deliver a knockout punch (one example was the president’s counter that sure America had a smaller navy than in l917 and we also don’t have bayonets and horses), Romney clinched. Of course the breaking news story was Romney’s turn around on Afghanistan. “Romnesia” is the diagnosis President Obama has offered for his rival’s condition. Now Romney agrees with Obama that US troops should come out of Afghanistan by the end of 2012. “People can accept changing your mind,” Sharpton said, “but not at the cost of my behind.” If Obama vs. Romney II was a dramatic comeback for the president, the third and final debate was characterized by a growing feeling of almost effortless humor--not only in the commentary, but particularly in the antics of the challenger. In comedy the clown has a straight man. 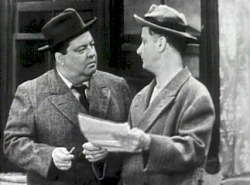 On The Honeymooners, you had the stolid Norton and the outrageous Ralph. Romney tried to be the straight man, not challenging, but agreeing, trying to calm down his adversary, but he turned out to be the clown. One can’t help wondering if Romney hadn’t gotten taken away by buffoonery of the Al Smith dinner. SNL's campaign send up where interviews with a series of voters reveal an electorate that neither knows who is president, who is running or how long they are running for may have also set the tone. Debates can somehow bring out moments of brilliance in one or another candidate, but this final debate, centering on issues of foreign policy, was notable for its intermittent, though comical effusions of ignorance on the part of the Republican candidate for president.